Or enter your own wedding vow to the right. Laser Engraved for accuracy and quality, our wedding vow rings are available in 14K white gold, 14K yellow gold, or platinum. Customize your ring from our traditional and non-traditional wedding vow listing or write your own vows to forever remind you and your spouse of the commitments made on your wedding day. 14K white or yellow gold, or platinum bands (by request). "I take this woman to be my lawful wedded wife, promise to love and cherish her, in sickness and health, for richer or poorer, for better or worse, and forsaking all others keep myself only unto her, for so long as I live." "I take this man to be my lawful wedded husband, promise to love and cherish him, in sickness and health, for richer or poorer, for better or worse, and forsaking all others keep myself only unto him, for so long as I live." 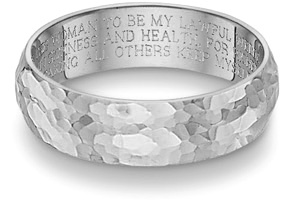 We guarantee our Hammered Wedding Vow Ring, 14K White Gold to be high quality, authentic jewelry, as described above.